The Putney-Victoria express, similar to Alan's train, is seen here cruising along the Putney Bay shore. Mt. Hayes, in the distance, is often snow-capped in winter, and shows its plume of steam. Alan settled into his seat in the middle car. The first car was also the engine, and the last car was the dining-and-club car, plus baggage and mail. The train had an aged, and often-restored look to it, that pleased Alan. As he entered the car, Alan saw a small brass plaque mounted by the door, which declared, in Russian and English: "This train car, proudly built in 1956, is a gift of the people of Czechoslovakia, 1982." Cream-colored paint and varnished wood trim filled the cars' interior, with seats of fabric upholstery sporting patterns of slightly-faded red roses and wisteria. The seats were spacious, arranged in sets of two that faced the next set of two, instead of all facing forward. He settled into his seat with a new book titled Eleanor and Park, a novel about a pair of 16-year-olds. Other passengers selected seats around him. He noticed many teenagers and slightly older-looking men and women with backpacks, and a few families; but the car was nowhere near full when the train started out. His seatmate didn't say anything, so Alan looked out at the scenery. The tracks followed the coastline just above the beach, and Alan watched the long and sizable waves rolling in. The ocean was calm except for the incoming swells. "That is pretty-good sized surf for this stretch of coast," the guy suddenly said. "I'll bet they'll be much larger once we round Roaring Cape! Do you surf?" "Oh, no," Alan replied, finally looking at the fellow, who seemed friendly enough. "I grew up by the ocean, but I wasn't a big swimmer. I like watching the surf, though..."
The train stopped again at Margaret Beach: a cluster of small houses, a store, a pub, and a tiny train station next to a small sandy bay. "That's Ten-window Bay", offered his seatmate, to which Alan had no reply. Sloops and gaff-rigged boats sat still next to a launching ramp and repair yard. Not much happening; mail bags were exchanged, but no one got on or off. As the train gathered speed again along the back side of the bay, Alan watched the grassy lowland glide by, and he could see massive Mt. Hayes looming in the distance to the north, a tiny plume of steam flowing from its peak. "Uh, do you know about that mountain?" Alan asked his neighbor. "I'm just wondering if it has ever erupted, or if it might some day..."
"Well, it hasn't erupted for many years, as far as I know. As for the future, I've heard many stories and rumors that it either won't ever erupt, or it'll go off tomorrow...take your pick!" Alan's train will take him southwest to Newport and beyond. The volcano in question lies about 30 miles to the north, at the upper left corner of the map. Victoria Harbor to ROSEVILLE with connections to PUTNEY. Note: flag stops are listed in italics. After breakfast, Alan waved to a pedicab driver to get him to the train station, and he made it with only a few minutes to spare. The Ustinovitch Station, named after a famous Soviet railway builder, looked very European, though not nearly as large as those in say, Paris. Once inside, he found his train easily enough: three-cars, electric-powered, rather elderly-looking, but turned out with a fresh coat of red paint. 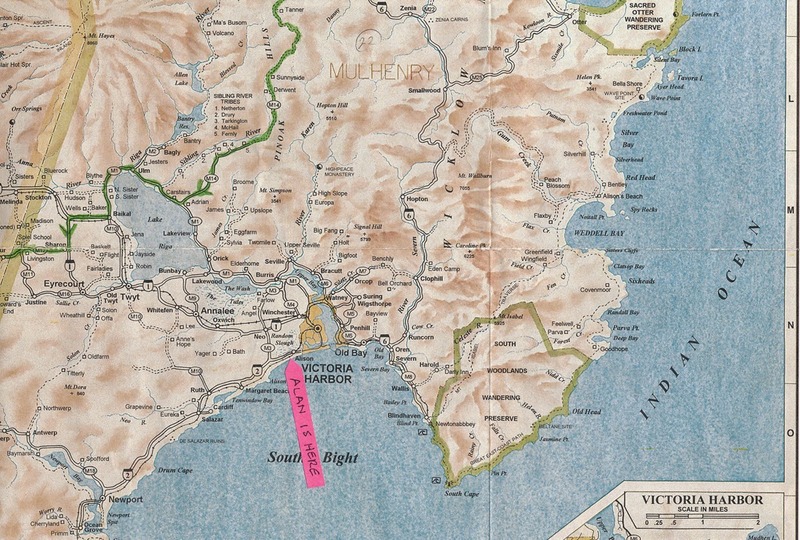 Another two-car train was waiting at a track marked "Blindhaven" which is a coastal town to the southeast, Alan noticed on his map. A few other passengers were getting on his train, but it was otherwise quiet in the station, perhaps because it was early. He was taking this local train so he could see the coast and as much of the island that he could before getting off at his destination near the town of Hazel. He could catch the late-morning Victoria-Putney express, which would get him there much faster...but perhaps another time. With his train schedule and his map in hand, and finds he'll be going down the southern coast to Roaring Cape, then on to the western end of the island, and then curving back to his destination near Hazel. Cool! He climbs aboard, finds a seat, and hopes they have coffee. 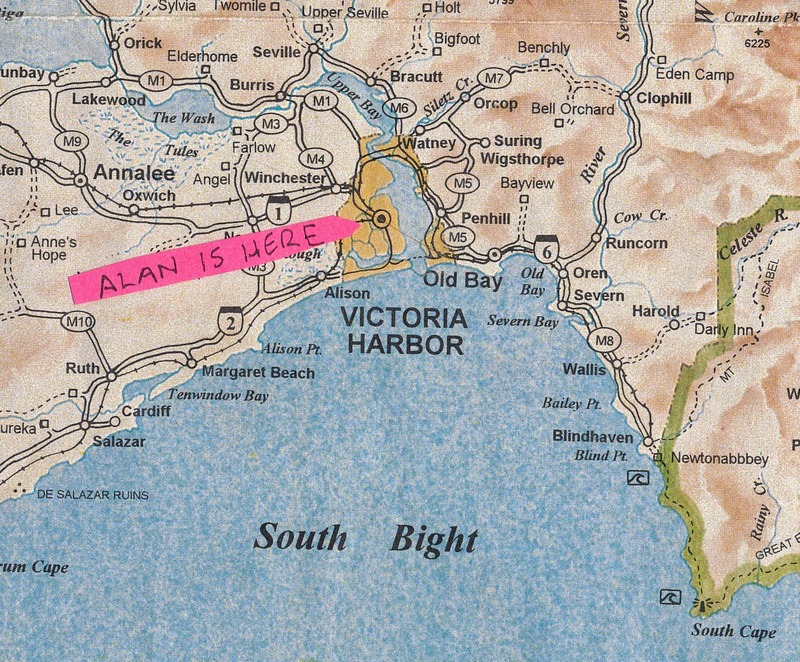 Alan will be heading southwest; Blindhaven is the other way. The next morning, Alan went downstairs early for breakfast; he needed to catch the 8 AM train to Hazel, his ultimate destination and home base. He was looking forward to getting there, a place he could only imagine, since he has seen no pictures. He brought along the train schedule he was given yesterday, and while looking it over, he noticed a few other lodgers already having coffee and reading the paper or talking. Then it hit him: no one was using a phone! Alan is no phone addict but he used it to check his e-mail, and was even learning text-messaging! Now he'll have to find a computer somewhere (he didn't bring a laptop) to see how his life is going. He wonders what Michelle is doing, but beyond her, he can't really think of too many people he'd want to talk to... And he has a hunch no one (except Michelle) really wants to talk to him either. He recalled verbatim his counselor-guy's suggestion to just "live in the moment, and pay full attention to whoever you happen to meet." Hm. At breakfast, he still feels unable to start any conversations. But when the young waitress comes for his order, he asks her about phones. "Well," she replies, "We just use the telephone in the hall." When he shows her his smartphone, she says, "Wow, I've heard of these, but I've never seen one up close - may I look? Holding Alan's phone, she marvels at how small and thin it is, and when she brushes a finger over the screen, she's flustered when all sorts of graphics and pictures flash at her. "Oh my, I don't know what I did here!" and hands it back. "That's okay," he says, and then orders from the menu. Resigned to no phone, Alan realizes that maybe that's just as well. He likes the idea of not having to keep up with the damned thing! He gets his order of eggs, some sausages they call bangers, a glass of orange juice, and some oatmeal with raisins, butter, honey and milk. Ummm, the coffee is good too. He left a generous tip, and walked out feeling just a bit lighter on his feet. Alan's lodgings, the Plakaford Hotel, were on a narrow side street off the Cold Water Channel. Alan felt a southern European influence in the look of these older buildings. The streets were mostly paved with brick or stone, liberally patched with concrete or sometimes asphalt. 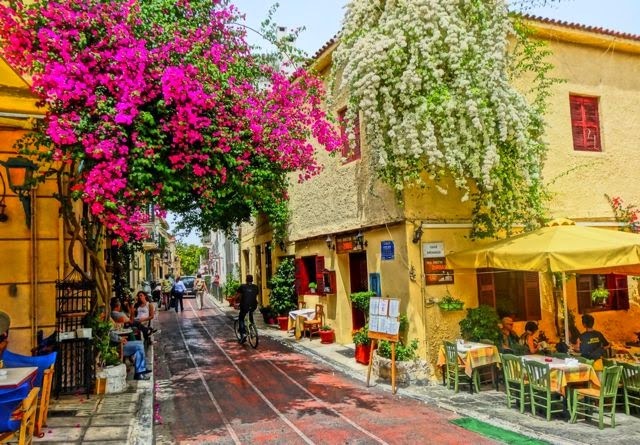 He loved the flowering vines and all the potted plants around his hotel, and the place itself looked quite inviting. "Welcome to our hotel, Mrs. Plakaford said as Alan checked in. "We were expecting you." Alan followed her up the stairs to a small room with a nice view over the outdoor cafe. "The room has a lavoratory, and the toilet is just down the hall and to the left. We serve coffee at 6:30, and breakfast at seven in our breakfast room, and I trust you will join us." "Oh, yes," Alan said, "that would be wonderful." Alan stood alone a minute in his room, the sun streaming in the window, and he realized, "Whoa, I'm really here aren't I?" The tuna was grilled, served with lettuce and mayo on toasted home-made bread. It was so delicious he seemed to devour it in two bites! The bread, made from brown rice flour, was surprisingly light and fresh. He went back for a scone and another cup of tea, and sat down again and looked around at the other customers. They were having coffee and chatting. Several women and a few couples spoke quietly, giving each other some intimate looks, tweaking Alan's feeling of aloneness. He imagined they were all madly in love with each other. He could start a conversation with the two women closest to his table, but he felt very, uh, foreign, he didn't want to intrude, and he couldn't think of anything to say anyway. It was getting late. Alan finished his tea and took his scone back to the Plakaford.